Whether you received your luxury watch as a gift, an inheritance, or as a treat to yourself, depending on your lifestyle you may not have occasion to wear it very often. The high value but limited wearability of luxury watches often makes them ideal candidates for use in securing a collateral loan. You can bring your watch in to South Bay Jewelry & Loan, get up to $50,000 cash to help cover immediate expenses, and then return to pay off the loan and recover the watch, all before the next occasion you might have to wear it. If you’re willing to part with the watch permanently, we also buy luxury watches for great prices. The more information you can provide about the provenance and value of the watch, the better. Bringing the original box and/or paperwork describing the watch will help our appraisers arrive at a fair value for the item. For example, maybe the watch has real diamond chips on the dial or bezel. Without the paperwork, it can be hard to prove the authenticity of such tiny diamonds. 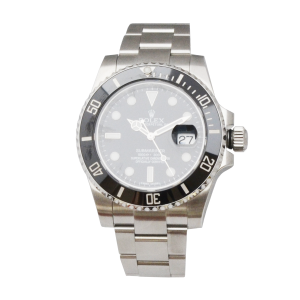 You can rely on the experts at South Bay Jewelry & Loan to provide an honest and accurate appraisal of your luxury watch based on all the information available to us. Our loan terms are also quite reasonable, with rates as low as 2 percent on some loans. If you’re interested in selling or pawning your luxury watch, please come visit us today. Our expert staff members are ready and waiting to answer all your questions and provide friendly, respectful, and honest assistance.